Who does not like Oreo Cookies? They are definitely one of my favourites cookies to dunk in a glass of milk. These chocolate dipped Oreo cookies look so fancy and seem like they are difficult to make, but it’s really the cookie candy mold that does all the work! What’s good is that they can be so versatile. You can make these for Easter with pink or purple candy melts, or have them all green for St. Patrick Day. They will become your family’s favourite cookies! 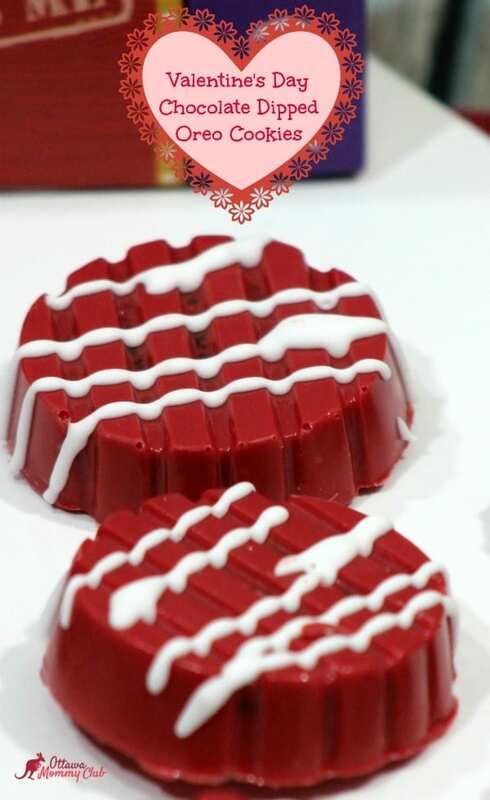 -Put red candy melts in the top part of a double boiler. Melt the red candy melts. -Pour the candy melts into the dot & stripe candy mold. -Fill the mold 2/3rds full. -Tap the mold gently on the counter to remove any air bubbles. -Gently place a Oreo cookie in each mold until the sides of the cookies are coated with the candy melt. Making sure that the candy coated cookie is level with the mold. -Refrigerate until the red candy coating has a frosty appearance. -Melt the white chocolate in the double boiler. -Once the chocolate has melted spoon it into a piping bag with a #3 tip. -Drizzle the red candy coated Oreo cookie with the white chocolate. -Allow the white chocolate to dry. I hope you enjoyed my Chocolate Dipped Oreo Cookies recipe as much as my family and I did. If you make it, make sure to share with us on Facebook or Twitter! Also, check out all of our other Recipes. Put red candy melts in the top part of a double boiler. Melt the red candy melts. Pour the candy melts into the dot & stripe candy mold. Fill the mold 2/3rds full. Tap the mold gently on the counter to remove any air bubbles. Gently place a Oreo cookie in each mold until the sides of the cookies are coated with the candy melt. Making sure that the candy coated cookie is level with the mold. Refrigerate until the red candy coating has a frosty appearance. Melt the white chocolate in the double boiler. Once the chocolate has melted spoon it into a piping bag with a #3 tip. Drizzle the red candy coated Oreo cookie with the white chocolate. Allow the white chocolate to dry. These cookies looked so decadent,cant’t wait to make this ! WOW these look absolutely amazing !! love the presentation of them, they are perfect for Valentines and easy to make! They definitely are super easy to prepare! We are having an ice cream sundae bar this weekend for Valentine’s Day and this would go great with it! We made these last night with the kids it was so much fun ! These would be fun for Christmas to. These also would be pretty as Christmas ones! Ohhh those look so fun! I love the idea of switching up the colours for the different holidays! I love Oreos so the fact that they’re dipped in chocolate makes me love them even more – good job, they look beautiful ! « Check Out the A-Peel of Arctic® Apples!